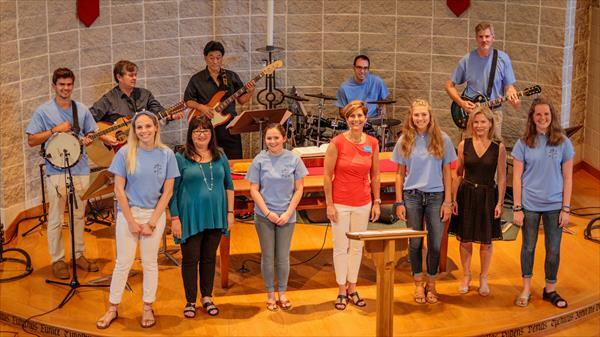 The Praise Band, under the direction of Sarah Kent, has the privilege of leading worship every Sunday morning at 11:00 a.m. There is a team of vocalists and musicians who take turns playing any given week. It is a joy to learn music together, fellowship and have fun! There is also a sound and projection team that assists in worship. If you are interested in being a part of this team in any way, please email Sarah Kent. The Woods Praise Band is involved in several community events every year. We participate in the Severna Park Fourth of July Parade, and the Severna Park Community Center Spaghetti Dinner Fundraiser. We also host two events yearly: an acoustic coffeehouse night and a night of rock 'n' roll favorites. We would love to have you as our guest at any and all of these events!